Yes, sometimes even the Hackers get Hacked. Hacking Team, one of the most controversial spyware and malware providers to governments and law enforcement agencies all around the world, allegedly been hacked, with some 500 gigabytes of internal data leaked over the Internet. The leaked data indicates that despite its denials, the spyware company did sell powerful spyware tools to oppressive regimes in Sudan, Bahrain, Ethiopia and Saudi Arabia. 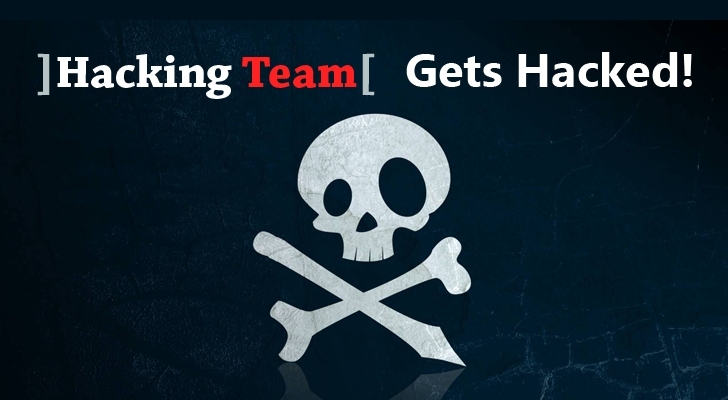 The unknown hackers not only managed to make 500 GB of client files, financial documents, contracts and internal emails, publicly available for download, but also defaced Hacking Team’s own Twitter account, replacing the company's logo to "Hacked Team." Hacking Team, also known as HT S.r.l, is an Italian company known for providing powerful surveillance software Remote Code System (RCS) to Governments and law enforcement agencies. The company previously claimed to only deal with ethical governments, although they have never formally disclosed the list of names and businesses. 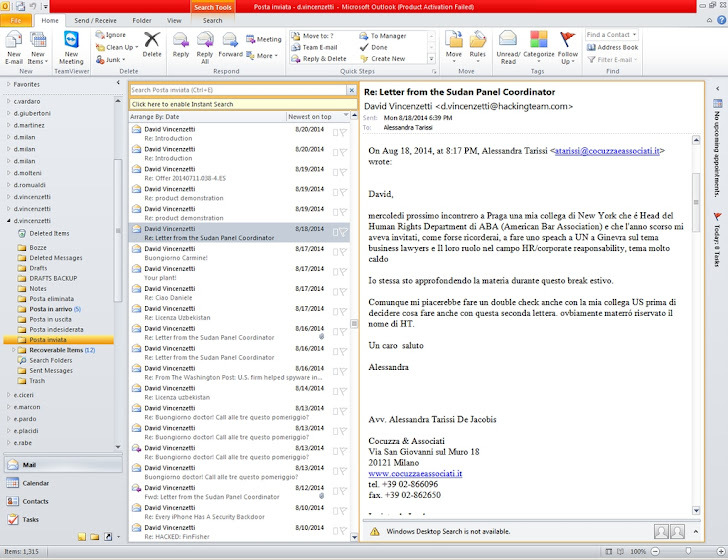 However, the data breach happened to Hacking Team appears to have revealed the list of its clients somehow. "Developing ineffective, easy-to-pwn offensive technology to compromise the operations of the worldwide law enforcement and intelligence communities." A tweet composed by unknown hackers reads, "Since we have nothing to hide, we are publishing all our emails, files, and source code," with the link to around 500GB of data. The leaked data has been uploaded to BitTorrent, allegedly including email communications, audio recordings, and source code. The data disclosed Hacking Team customers along with the dates of their purchasing the software. A few hours later, the list of alleged Hacking Team customers, including the past and current clients, was posted on Pastebin. The most notable and previously unknown ones are the FBI, Spain, Australia, Chile, and Iraq, among others. 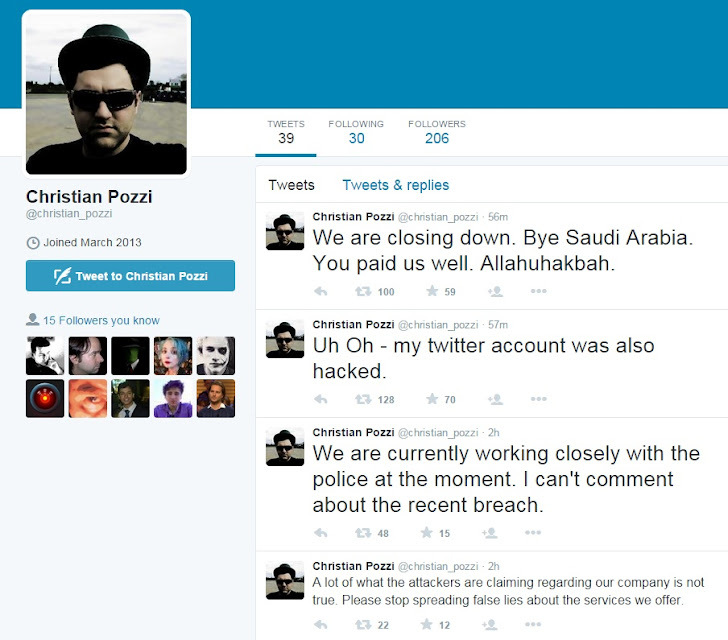 The Twitter account of Christian Pozzi (@christian_pozzi), a Hacking Team representative who was personally exposed by the incident, is also get hacked few minutes ago. 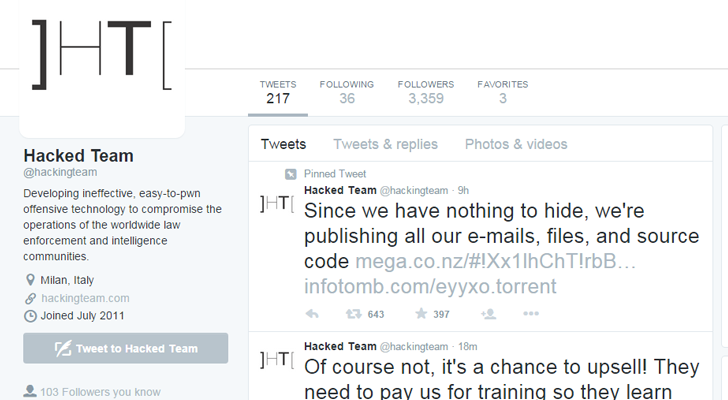 Hacking Team has yet to verify that it has been breached and that the hacked information is legitimate. As it's hard to say the leaked data is real without any confirmation from the company itself.